Beurre Maître d’Hôtel is a French classic. It is traditionally served on top of a hot steak but can be enjoyed on mashed potatoes or frilled vegetables. 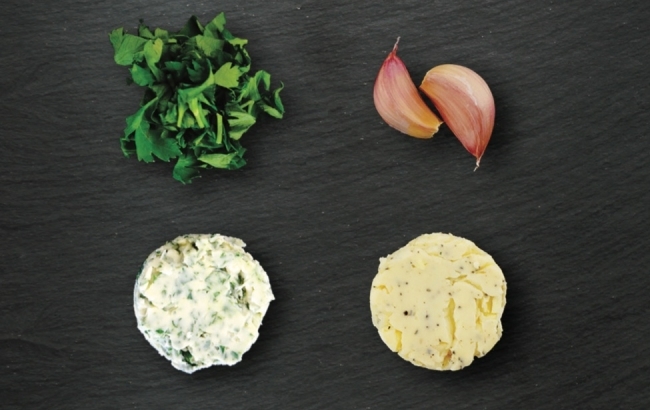 Combine 1/2 cup butter with 1 tablespoon minced parsley and 1 teaspoon fresh lemon juice. Add fine sea salt and freshly ground black pepper to taste. Shape butter into a cylinder, wrap in cling film and refrigerate or freeze until ready to use. Use it to make your own garlic bread or to season roasted vegetables to perfection. Combine 1/2 cup butter, 1 clove minced garlic, and fine sea salt and freshly ground black pepper to taste.